This article provides an overview of Access web database design. For an introduction to desktop database design, see the articles Create a new desktop database and Database design basics. 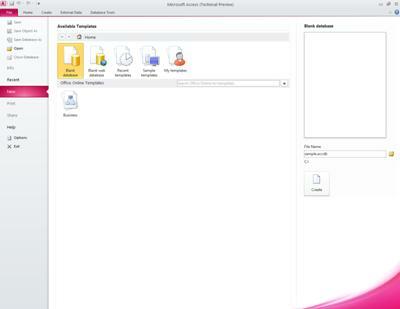 Access 2010 and Access Services (an optional component of SharePoint) provide a platform for you to create databases that you can use on the Web. You design and publish a web database by using Access 2010 and SharePoint, and people who have SharePoint accounts use the web database in a web browser. When you publish a web database, Access Services creates a SharePoint site that contains the database. All of the database objects and data move to SharePoint lists in that site. The following video illustrates the process. You can open the web database in Access, revise the design, and then sync your changes — effectively, save them to the SharePoint site. The following video illustrates the process of making a design change after you have published your web database. Note: To build a web database, you need Full Control permissions on the SharePoint site where you want to publish it. For more information about SharePoint permissions, see the See Also section. Forms, reports, and most macros run inside the browser. This lets Access refresh data on the screen without having to redo the whole page. Security Note: The connect string for linked tables is unencrypted, including the username and password if that information was saved (and the link target supports user accounts). In a database that has a link to a SharePoint list and the link includes the username and password, a malicious user could change which list is the target of the link, using the saved credentials. Even if the credentials aren’t saved with the connect string, a malicious user could modify permissions on the SharePoint site with the assistance of a collaborator who already has sufficient permissions. Exercise caution when you share copies of a database that contains links to lists in a published web database. All SQL processing happens on the server. This helps improve network performance by limiting traffic to result sets. You can publish to your own intranet SharePoint server, or to the Internet. Microsoft is offering an Internet-facing, hosted SharePoint solution. You can review the available templates on the New tab in Backstage view. 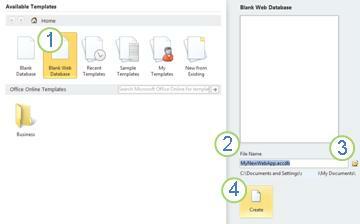 For more information about the templates that come with Access 2010, see the article Select and use an Access template. You use Datasheet view to design a web table. Use the Expression Builder to create the calculation for the field. Remember that you can only use other fields from the same table as data sources for the calculation. For Help using the Expression Builder, see the article Use the Expression Builder. You can use an expression to validate input for most fields. You can also use an expression to validate input for a table, which can be useful if you want to validate input for a field that does not support validation, or if you want to validate field input based on the value of other fields in the table. For a more thorough explanation of validation, see the article Restrict data input by using a validation rule. Use the Expression Builder to create your validation rule. For Help using the Expression Builder, see the article Use the Expression Builder. For more information about creating data macros, see the article Create a data macro. You can use a query as the data source for forms and reports. Queries run on the server, helping minimize network traffic. Forms are the main way to enter and edit data in your web database, and are also useful for reviewing data. Forms run in the browser, helping optimize performance. When you open a form, your browser retrieves the required data from the SharePoint server. You can filter and sort the data in the form without having to retrieve data from the server again. Reports are the main way to review or print data from your web database. Reports run in the browser, helping optimize performance. When you open a report, your browser retrieves the required data from the SharePoint server. You can filter and sort data in the report without having to retrieve data from the server again. You can watch a video of this process in the Overview section. In the Server URL box, type the web address of the SharePoint server where you want to publish the database. For example, http://Contoso/. In the Site Name box, type a name for your web database. This name will be appended to the Server URL to produce the URL for your application. For example, if the Server URL is http://Contoso/ and the Site Name is CustomerService, the URL is http://contoso/customerservice.